Keep your data in sync between Mac and multiple devices or online accounts. No need to purchase several sync solutions in order to sync your Mac with each device or account - just download SyncMate and all supported devices will be synced within one application. You can try out Free edition and then upgrade to Expert. What makes SyncMate outstanding? Let us think. Maybe the fact that it offers its own SyncService which makes data transfer between Mac and almost any device or account possible? Below we’ve listed the key features of SyncMate, enjoy. As you know, there is no built-in option to transfer data between macOS and Android. SyncMate fills this gap and gives you a unique possibility to sync almost any data between Mac and Android. As for syncing with iOS - SyncMate doesn’t limit the quantity of iOS devices you can connect and sync with Mac. Need to sync files between Mac and any mounted or MTP device? No problem. Just get yourself SyncMate and data will be updated across all devices. Did we mention the possibility to sync several Macs? Yes, SyncMate can do this also. You may ask - why do I need SyncMate if I can use Dropbox and iCloud accounts separately to sync all required data? SyncMate turns your macOS computer into a sync center - all of your accounts will be synced with Mac within ONE app, which extremely convenient if you are relying on several cloud storages. SyncMate gives you a unique possibility to sync data on your Mac with Microsoft services - Outlook online account or Office 365 Home and Business editions. Besides mentioned above services, SyncMate will also keep data updated between your Mac and OneDrive storage. SyncMate gives you so long-awaited flexibility in Mac data synchronization. You can choose out of two editions SyncMate offers depending on data you need sync. So, what’s inside SyncMate Free Edition? All your contacts can be available on any of your devices upon sync instantly without adding them manually one-by-one. SyncMate keeps everything up-to-date according to the settings you choose. Never ever miss an important date or appointment, even if you added it to your phone calendar and don't have it with you. SyncMate will make sure that calendar events are updated on all synced devices, be it a computer, a phone or your cloud account. The most convenient thing is background synchronization - you don't even have to open SyncMate. You'll need to look at the settings once and then the app will meticulously update all data quietly in the background. For those of you who want to keep literally all Mac data updated across devices and accounts, we’ve got SyncMate Expert Edition with extra synchronization options. Load your folders with files and get access to them on any of synced devices. No need to manually copy or move anything when you have SyncMate. Your favorite tracks and playlists will be instantly available on any of your devices, or computers, or online accounts. No need to worry about photos backup when you set up SyncMate to sync your images. Every new image will be updated on each synced device. All your regular syncing actions can be performed automatically by SyncMate. Choose what and how you'd like to be synced and let our app do the rest! Mounting your device as a disk means you can access and manage its content in Finder just like you would with any regular computer drive. Receive, reply, delete and even export your text messages directly on your Mac with its nice full-size keyboard. Your favorite pages in Safari browser can be synced across supporting devices for easy instant access any time. Whenever you might need to refer to your call history you can see incoming, outgoing and missed calls directly on your Mac with extensive details. SyncMate Expert will backup your contacts, calendar events, reminders, and Safari bookmarks directly on your hard drive. Why do I need to sync data on Mac? Because it’s easier and will save your time compared to manual data update across all devices. Bet you do not want to spare time on adding new contact on Mac, then on your smartphone and in cloud storages. With SyncMate all you need to do to keep your data updated across all devices and accounts is connect device or account to your macOS computer and choose which data to sync. It only takes minutes. Is my data safe with SyncMate? Data security - that's what we care about the most. SyncMate doesn’t share your data with any third-party services, it syncs it directly between Mac and device or online account. For example, you are looking for Android sync Mac solution but do not want to share data with Google storage during the sync process - just sync these devices directly using SyncMate. What is the difference between data synchronization and data transfer? Data transfer is basically when you take a piece of data and move it from one device to another. You can transfer data between computer, mobile device, cloud storage, you name it. While SyncMate is an excellent data transfer tool it actually syncs data instead of just moving it. Synchronization is when data is equally updated on each side of the sync process so in result you are getting the latest version on every device as soon as changes are made. SyncMate is deservedly one of the best apps to synchronize Mac. Below are the key features that make SyncMate stand out among competitors. It has its own sync service which fuels data sync and transfer. SyncMate is probably the only app that supports such a wide list of devices and accounts and can sync them within one app with your Mac. We’ve gathered the full list of apps to sync Mac so you can make sure that SyncMate is worth your time. 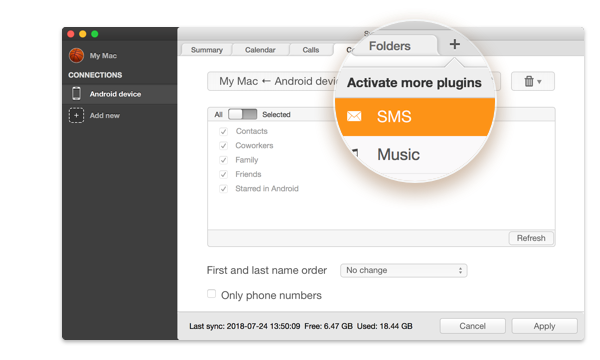 Yes, SyncMate can replace Android File Transfer Mac and in fact SyncMate gives you even more functionality. Not only can you transfer data between macOS and Android (Mount Disk option will show you Android folders in Finder on Mac), but you can also sync data between corresponding apps on Mac and in Android. 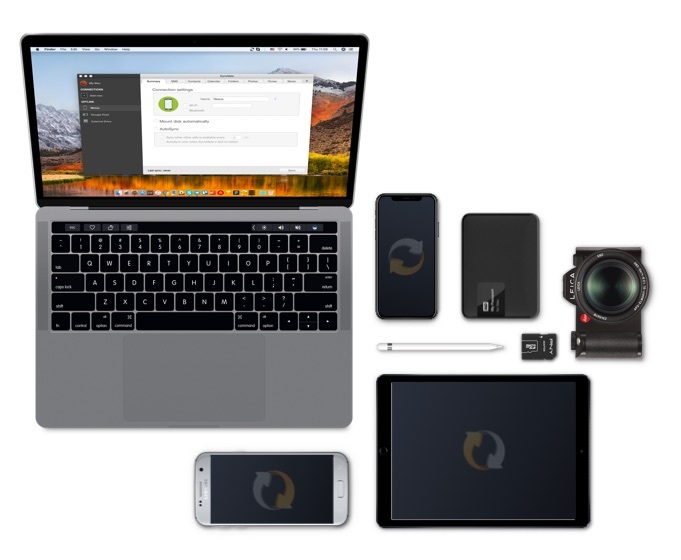 SyncMate doesn’t limit the quantity of devices or accounts you can connect to your Mac and sync with, thus turning your computer into a sync center. This fact is more than important for iOS sync Mac solution, because no matter how many iOS or Android devices you have - all of them can be synced with your macOS computer. Can I sync data using SyncMate if there is no Internet connection? SyncMate allows to synchronize Mac with devices/accounts via USB, Bluetooth or Wi-Fi (depends on devices or accounts you need to sync). Does SyncMate sync data between Mac and device directly or does it use third-party services? Because it has its own sync service, SyncMate doesn’t use any third-party apps or storages while syncing - everything is performed directly between Mac and connected device or account. Is there any integration with apps or is data just stored on device in a separate folder? 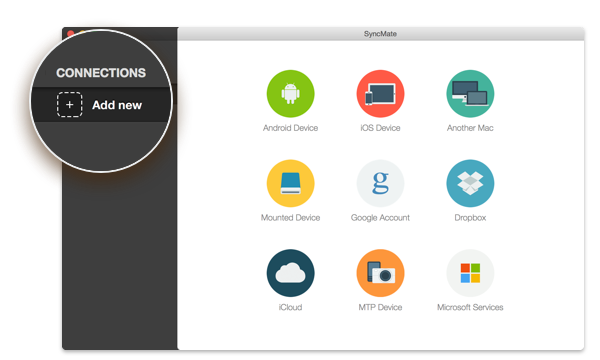 SyncMate offers you full integration with all apps in macOS and supported devices or accounts. This means that if you are syncing contacts between devices, they are synced between Address Books, media is synced directly between Photos and gallery on connected device. So if there is an app for separate data in device or online account, SyncMate will sync data with this app directly. And what about syncing with Microsoft services? SyncMate allows syncing with Apple devices and accounts as well as with non-Apple ones. Microsoft services are also supported - Outlook online account, Office 365 editions and OneDrive. The most frequently used features of this direction are Outlook contacts sync Mac and Outlook calendars sync with Mac, but note that due to macOS limitations SyncMate supports Outlook sync with Outlook online account only. 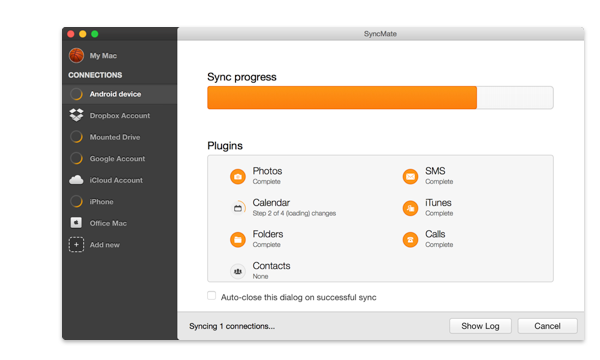 To demonstrate that syncing Mac data with SyncMate is as easy as can be, we’ve listed main sync steps below. Once SyncMate is installed and launched, choose the device you want to sync. When device is connected, choose data to sync and set sync parameters. That’s all. Click “Sync” button and enjoy your free time while SyncMate does all tedious sync job for you. Mac synchronization is great. I carry a portable firewire drive with me and I wanted to sync it with a drive at work and at home, but I wanted it painless. With this program, I can plug in the drive on my work computer and it will auto sync the drives for me, so I don’t need to do anything manually. I was looking for a reliable solution that will synchronize Mac for a while. I mean syncing data exactly, not just transferring. And SyncMate does this perfectly - no need to update data manually, I'm just launching SyncMate and synchronization starts. Synchronize Android Mac? I thought this is impossible until I found SyncMate. It allows not only syncing Mac to Android (and vice versa) but also mounting Android as Mac disk and work with it in Finder. Great job! Syncing Mac data has always been a headache for me. I have Android, Windows computer and MacBook, and SyncMate is the only tool I found that combines Mac data synchronization with all these devices within one app. Really impressive.